This Soy-Glazed Roasted Chicken has the most amazing caramelized crust, and the flavors will send your taste buds on a trip to Thailand! Last Sunday, Joel decided to make his famous smoked chicken. I had 2 organic chickens I purchased at Costco on Monday, and Sunday was the “use by date”; so they needed to be cooked. Well, words are great, but the actions were lacking. In other words…he forgot! Hmmm…as he spent all day Saturday and Sunday in his study working on a speech he is making for Dentsply at the Opinion Leaders Forum in Playa del Carmen, Mexico next Saturday, I think there is a strong possibility he very conveniently forgot??? It is funny how things sound good in the morning, but by the time you start running out of steam in the afternoon…not so much! Happens to me all of the time! So in the middle of the afternoon I realized I was going to have to spring into action if there was going to be any dinner on the table. As I needed to photograph the Soy-Glazed Thai Roasted Chicken recipe, and not to mention the fact that I love this roasted chicken recipe…Soy-Glazed Thai Roasted Chicken it was! 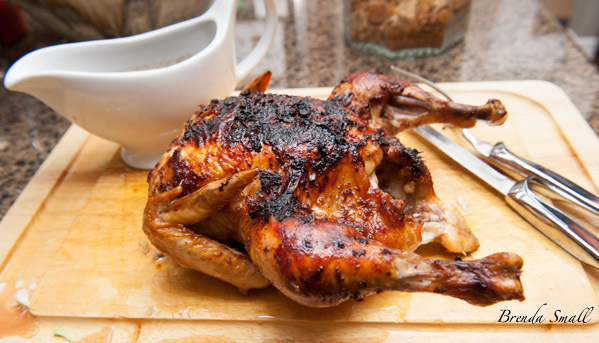 This roasted chicken is moist and juicy, and makes great leftovers to reward you to your efforts. I made both of the chickens I had with this recipe, and it was enough for leftovers on Monday night. On Tuesday night, I made a salad with Asian Ginger Dressing and added the leftover chicken that I shredded. 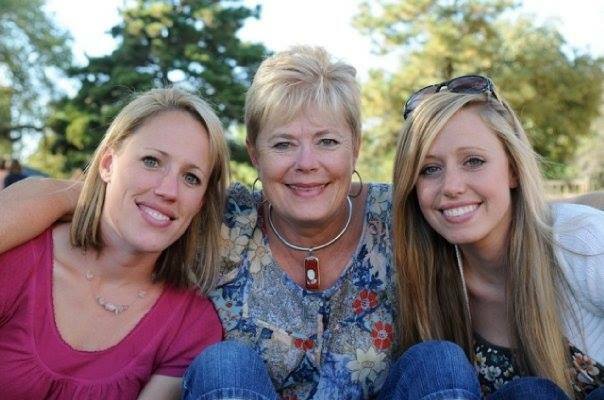 3 nights of awesome food…that’s what I’m talking about!! 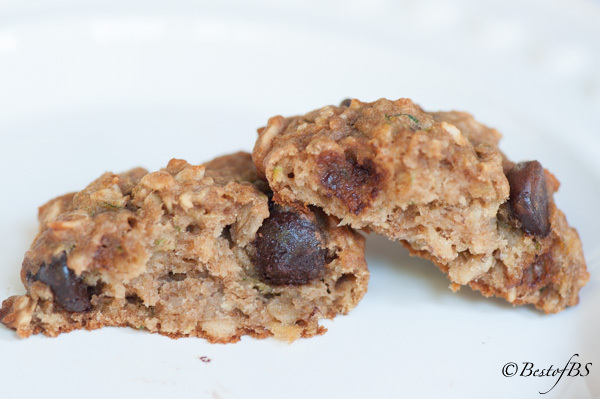 This recipe was inspired by one I found on the Serious Eats website and was submitted by Jennifer Olvera. After minimal tweaking, it has quickly become one of my favorite roasted chicken recipes, which makes sense, as I’m a fanatic about Asian flavors. 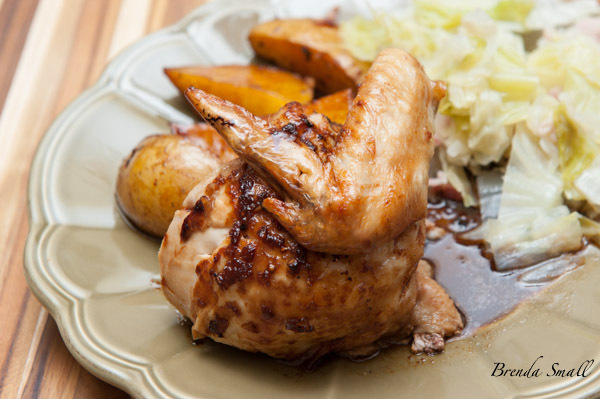 It makes a great presentation…the sugars caramelize on the skin to produce a great brown color, the flavors are awesome…I could drink the sauce and the chicken has come out moist and juicy every time I’ve prepared it. I think I have made it at least 5 or 6 times now, always with success. 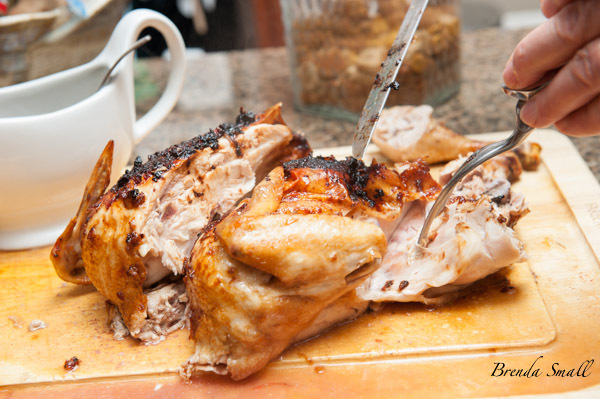 If the chicken starts to brown too fast, simply lay a piece of aluminum foil, shiny side out, over the chicken. This is the brand of organic chicken I purchase at Costco. 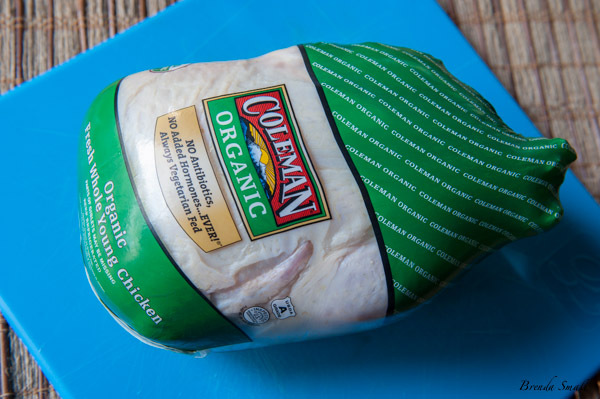 In the Coleman brand Organic chicken, Costco carries the whole chicken, boneless, skinless breasts and boneless, skinless thighs. I have been using this brand of organic chicken for several years now, and I have always had success with it. I love using the thighs for most of my Asian dishes, as they seem to be more moist than the breasts when cooked. I even sometimes grill them, and they turn out great if I’m careful not to overcook them. These ingredients, which are some of my favorite Asian ingredients, are the ones you will need for the Soy-Glazed Thai Roasted Chicken. 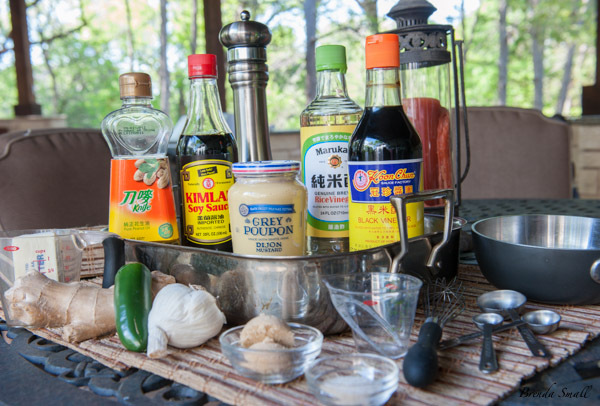 Here are the ingredients you will need, and, as I have said before, “I love Asian everything”! These are the brands of peanut oil, soy sauce, dijon mustard, rice vinegar and black vinegar I use. They are some of my favorite Asian ingredients. These flavors make my mouth water! If you live in an area with an Asian grocery store, they will have them all. If you live in the Plano area, there are several Asian markets I love and shop at often. The Jusgo on Legacy, just west of Central Expressway, is the one I go to almost once a week. The other one I really like is the HMart on Avenue K around Parker. Both have everything you will to become an Asian Foodie! They also have a great selection of produce and meats at really good prices. These OXO 4 tablespoon measuring cups, the small whisk and the small Pyrex bowls are some of my favorite kitchen tools. I use them almost every time I step foot in my kitchen. I would like to suggest that when you purchase the Asian ingredients, you give them a taste so you understand the flavor each one contributes to a recipe. Then, you could start using them to change the tastes of other recipes and create new ones. This is what the sauce should look like when it is thickened. 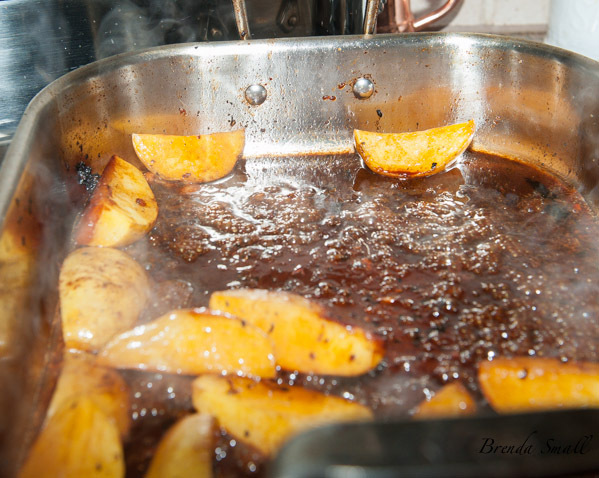 While the chicken is resting, place the roaster with the potatoes and the sauce in it, on the stove top. Stirring and scraping the bottom constantly with a wire whisk, simmer the sauce until thickened. Then, remove the pan from the stove and whisk in the butter. I hope you have as much success with this awesome chicken recipe as I have had. Please let me know when you try it, and how it turns out. If you have any questions, be sure to post them in the comment section. This Soy-Glazed Roasted Chicken has the most amazing caramelized crust and the flavors will send your taste buds on a trip to Thailand! 1½ pounds fingerling potatoes (may use small Yukon Gold potatoes cut in half) The potatoes are optional. 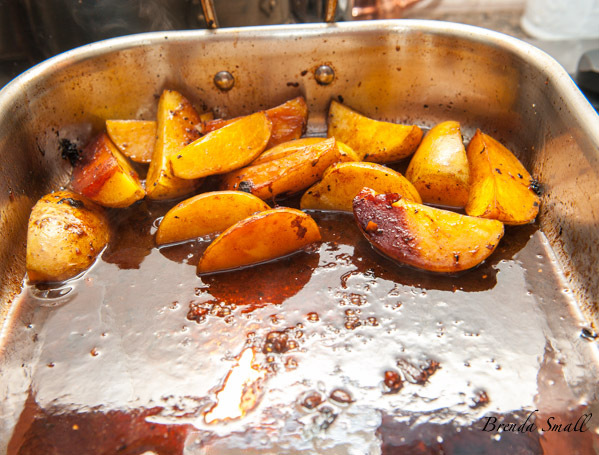 Spray the bottom of a small roasting pan with Pam. Remove the chicken from the packaging and discard the giblets. Allow the chicken to come to room temperature while you are preparing the sauce. Adjust the oven rack to the lower-middle position. Add1tablespoon of the peanut oil and swirl it around to cover the bottom of the pan. When the oil is shimmering, add the garlic, ginger and sliced peppers. Lower the heat to medium and saute until the vegetables are softened, about 3-4 minutes. Stir in the remaining peanut oil, soy sauce, mustard, vinegars and sugars. Stirring often, simmer until the sauce is slightly reduced and thickened to a thick sauce-like consistency (about 10 minutes). Remove the pan from the heat and allow the sauce to cool and thicken a bit. Liberally brush the outside of the chicken with the sauce. Transfer the roaster to the oven and roast about 1 to 1-1/2 hours, or until a meat thermometer inserted into the thickest part of the thigh registers 175F, and the juices run clear. Baste about every 20 minutes. If using the potatoes, add them to the roaster around the chicken after about 30 minutes of cooking. If the chicken starts browning too quickly, simply lay a piece of aluminum foil, shiny side out, over the chicken. Remove the roaster from the oven, and transfer the chicken to a platter. Tent with foil and allow to rest about 15 minutes. While the chicken is resting, place the roaster (leaving the potatoes and sauce in it) on the stovetop over medium-high heat. Using a flat whisk, add the wine, scraping the browned bits from the bottom of the pan. While whisking the sauce constantly, bring to a boil. Lower the heat to a simmer and cook, stirring constantly, until the sauce is thickened and reduced, about 10 minutes. Remove the roaster from the heat and whisk in the butter. Carve the chicken and place on a platter. Mound the potatoes around the chicken. 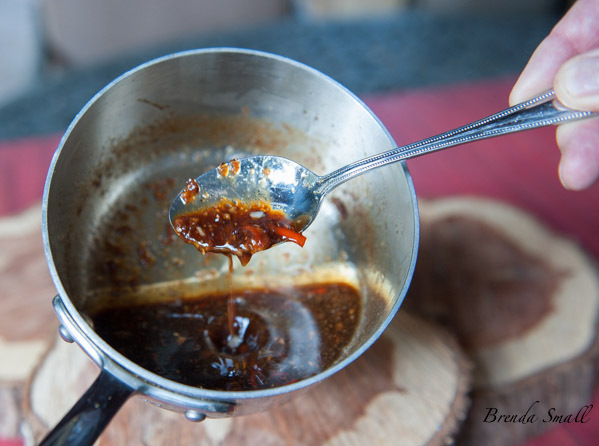 Either drizzle with the sauce, or serve the sauce in a gravy dish along side the chicken.